Baking with 4 ingredients challenge here I come! I’m joining Bake-Along No.24 hosted by Zoe from Bake for Happy Kids, Lena from Frozen wings and Joyce from Kitchen Flavours with the theme of baking with just 4 ingredients. 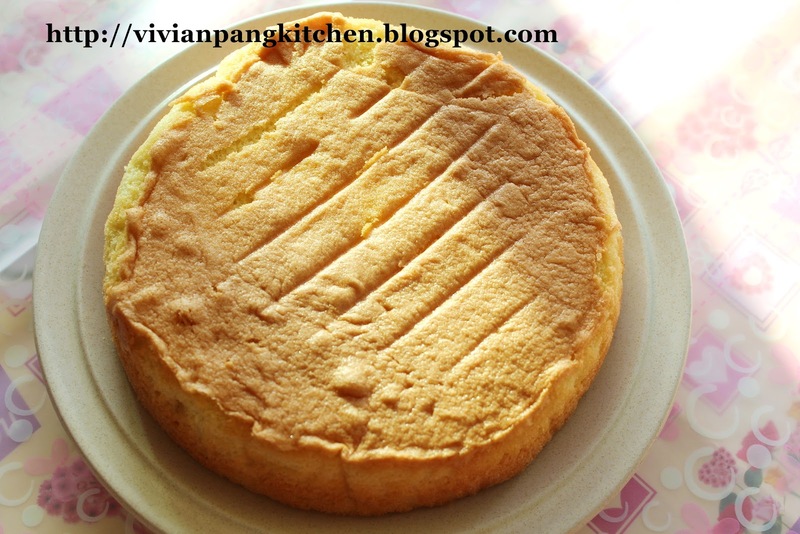 I present you this simple sponge cake. With the air incorporated inside the batter during the beating process make this cake soft and spongy although without any raising agent. You can bake this as the base for birthday cake or having it just like that. 1. Put the eggs and sugar in a mixing bowl. Place the bowl on a pot with simmering water. Beat with electric mixer at high speed till light and triple in volume (testing by draw an 8, it should stay for few seconds before disappear). 2. Add in the sifted flour in 3 batches. Fold till well combine. 3. Spoon 3-4 tablespoons of batter into the bowl with 20g oil. Stir to mix well. 4. Pour back into the main batter and fold till well combine. 5. Pour into a lined 6' round pan. Bake in preheated oven at 160C for 30 minutes. 6. Once done immediately remove from oven and turn over the cake on wire rack. Cover it with wet cloth and leave to cool. 7. Once completely cool remove the lined paper. Place into plastic bag and keep overnight before use or serve. Do hop to others and find out what have they baked with limited 4 ingredients. Your sponge cake looks very spongy! It is hard to tell that it uses only 4 ingredients! Really great recipe! Thank you for baking along with us! Wow, I've never seen sponge cake with so little ingredients before. I must try! 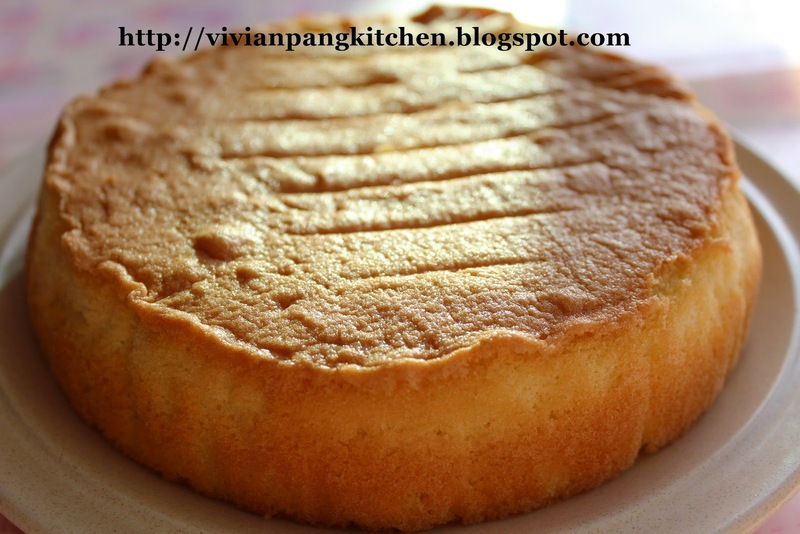 I use sponge mix for my sponge cake and always found it is too sweet. Now with your recipe I would have 'too sweet' problem again.. Thanks n have a great week ahead. A cake with just 4 ingredients! Vivian, your cake looks amazing! excellent!! i like the simplicity of this sponge cake, thank you so much for sharing this sponge cake recipe with non egg separation method...i'm sure many will find it useful!! What size is this cake, 18cm? Yes, 18cm pan. Happy baking!